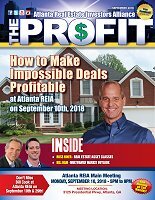 The September 2018 Edition of The Profit Newsletter, the official newsletter of the Atlanta Real Estate Investors Alliance, is now available for download. There are 44 pages this month full of upcoming meetings, workshops, webcasts, educational articles and other valuable information for your real estate investing pleasure and success. Download it and check it out!